Victorian Martial Arts: Bartitsu Relaunches May 25th!!!! The Lost Martial Art of Sherlock Holmes is BACK! Bartitsu and the old Bartitsu Club were key components as we were designing the Forteza studio. Designed as a way to introduce other martial artists to the unique “fusion” and “combat improvisation” of Barton-Wright, the one major request we had from students was a more structured way to introduce new comers to the fundamental boxing, kicking, throwing and stick-fighting skills upon which Bartitsu is based. We listened, and after a year of fine-tuning, Bartitsu returns to Forteza on May 25th with a five hour workshop taught by renowned Victorian martial arts historian and Bartitsu Club of Chicago founder, Tony Wolf. A highly experienced martial arts instructor, Tony has taught Bartitsu intensives in England, Ireland, Italy, Australia, Canada and throughout the USA. Tony also edited the two volumes of the Bartitsu Compendium (2005 and 2008) and co-produced/directed the feature documentary Bartitsu: The Lost Martial Art of Sherlock Holmes (2010). But the relaunch does not end with the workshop. Tony will be ably assisted by Forteza instructors Nathan Wisniewksi and Treyson Ptak, who will then be taking the lead with our newly designed Introduction to Bartitsu course. Beginning June 5th, 6-week class is designed to instill basic striking, kicking, cane-fighting, grappling and safety skills. Perfect for those new to martial arts as well as those who are not familiar with the particular art which comprise Bartitsu, this course is high-energy, skills-focused and designed to lay a foundation that students will bring to on-going training in the Bartitsu Club of Chicago. 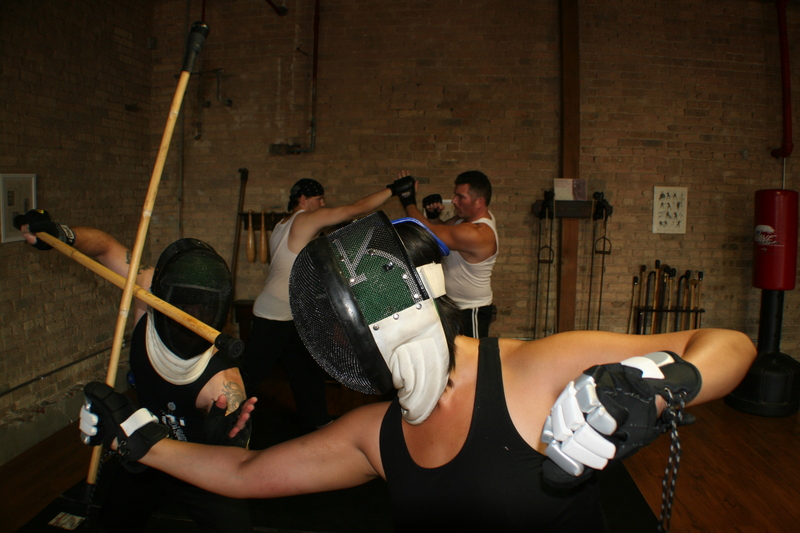 The club meets twice a month for advanced training and “combat integration” – the unique blending of its component arts that makes Bartitsu an unique fighting art in its own right. Physical Culture; a truly “old school” workout regimen of calisthenics, Indian clubs, and more! As we have done previously with our wildly popular Bowie and ‘hawk seminars, Antagonistics will be taught in a series of workshops and short courses, allowing students with limited time and busy schedules to get chance to sample the breadth of 19th century martial culture. Whether you’ve trained us before or are brand new to any martial arts, there are many ways to jump in to the relaunch of our Victorian Martial Arts program, and the sooner you get involved, the more affordable it is! Cost – $125, discounted to $100 for seminar attendees! Pre-register for both the seminar and introduction for $150, a $50 savings! Cost: $50/month and includes on-going access to the Introduction class, providing 10 hours of training a month! One day workshops and short courses are held throughout the year and registered for separately. As you can see, if you are called to by the rough-and-tumble and gentleman duelist side of the Victorian-era calls to you, there are multiple ways to get involved and start training today!